Whether your organization has HIT in place today or preparations for meaningful use are just beginning, now is the time to understand your environment, locate where patient information exists, and prioritize your needs. Care providers are incentivized to reach meaningful use by 2015, after which date Medicare reimbursements will be reduced. Enterprise data management is complex and further complicated by the data quality and political governance challenges that arise when organizations attempt to share or exchange information. • Can patient information be retrieved without a unique patient identifier such as a Social Security number? • Can updates to this information be shared with outside facilities or between inpatient and outpatient facilities? • Are there gaps in the information due to its location in specialty systems or practices outside your organization? • How much time does your staff spend seeking information to facilitate care coordination? • Can you achieve a single view of patient data across your organization to report quality measures? Many detailed questions remain regarding what constitutes meaningful use. Regardless of the rule’s final outcome, it seeks to achieve patient safety improvements, reduce the cost of care delivery, prevent disease, better coordinate care, and improve population health while ensuring that patient privacy is protected. To achieve these goals, interaction and interoperability must increase across multiple points in the healthcare ecosystem. This requires bidirectional information exchange and improved communications about patient status and outcomes among providers, patients, and care facilities. Health information technologies such as EMRs, PHRs, e-prescribing, practice management, health information systems, and clinical portals each contribute to improvements in information access at many points of care. However, these technologies alone do not deliver a shared, consistent longitudinal patient medical record necessary to meet the goals of meaningful use. Patient records must be located across system silos and properly linked to make available a record that is suitable for sharing across all points of care both internal and external to a healthcare organization. A patient registry is a necessary component of the information exchange infrastructure that links different representations of a patient between systems, facilitates access to relevant information, and allows interoperability to be realized. Having a patient registry at the foundation of HIT infrastructure allows providers to leverage the systems they have in place today and create a meaningful EHR that links patient records across registration, clinical, and lab systems. Associating medical records helps caregivers access all relevant information about a patient regardless of the way the data are maintained and managed from one system to another. The patient registry facilitates EHR adoption by enabling secure, consistent, and coordinated communication between providers to create a trusted patient-centric view. These capabilities enable providers to confidently access information and make more timely and effective decisions, resulting in an improved workflow that allows healthcare organizations to deliver patient-centric, coordinated care and reduce the number of adverse events while also improving the overall cost of care. 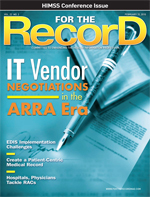 • Integration with new and existing systems: A patient registry should seamlessly integrate with the existing IT infrastructure, including specialty systems and new technology as it is enabled. It must be hardware and software agnostic to support interoperability efforts without disrupting current systems or replacing legacy applications. • Data governance and control: Healthcare organizations must manage what data are shared and with whom based on patient consent. When patient data are requested by another organization, patient consent preference, which may be stored in the patient registry or in an external enterprise security framework, must be honored. A patient registry can help healthcare organizations overcome common privacy challenges encountered with distributed data ownership, limiting data access only to authorized users. • Efficient data management: An effective solution must deliver both automatic data issue resolution capabilities and tools to alert data stewards to where manual resolution is required. Without these tools, significant human resources will be required to accurately collect data across heterogeneous systems, and cost reductions will not be achieved. • Scalability across multiple sources: The patient registry must be capable of supporting additional systems over time without a negative impact on performance or response time. It must scale to support large numbers of transactions per second across a diverse ecosystem of applications to meet the demands of real-time access to patient information. It must search across not only current patient demographic information but also historical data to enable comprehensive matching across records. • Standards compliance: Cross-boundary information exchange to enable care coordination requires compliance with standards for data sharing to ensure ongoing interoperability with systems that cannot be redesigned. A patient registry must support leading healthcare standards such as Health Level Seven International and the National Institute of Standards and Technology and should have successfully demonstrated compliance with the Integrating the Healthcare Enterprise profiles supporting patient matching and data sharing, including Patient Identifier Cross-Reference/Patient Demographic Query, Patient Administration Management, and Audit Trail and Node Authentication. These profiles demonstrate rigorous testing in real-world scenarios—a true illustration of today’s healthcare environment. • Extensibility beyond patient data: Interoperability is a journey, not a short-term endeavor. After connecting patient records among affiliated facilities, the scope will expand to nonaffiliated providers (community physicians), payers, and government agencies. A connected community facilitates coordinated care through a broader understanding of the patients, their providers, and the relationships among them. • Proven implementations with real-world references: While interoperability and information exchange is not a new frontier and many healthcare organizations have reached that goal, it can be a difficult challenge. To ensure success, it is critical to leverage the experience and best practices from healthcare organizations that have overcome common challenges. Healthcare organizations should not wait for the meaningful use criteria to be finalized to understand the current state of their systems and their future needs. Be prepared with a vision for how to achieve a patient-centric view and enable bidirectional exchange across boundaries to improve care coordination and patient safety and ultimately reduce the cost of healthcare delivery. — Lorraine Fernandes, RHIA, is vice president and ambassador for Initiate Systems.